Booking a private charter in Palau is a great way to experience and see our awesome country. Private charters are ideal for families, groups of divers, very experienced divers, new divers,film crews, honeymooners and those who want total control of when and where they go. Many guests of ours want to see Palau on their own schedule with their own group of friends or family and a private charter offers all of these benefits. 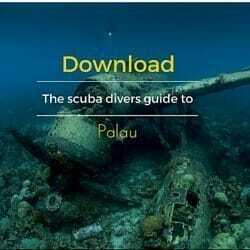 If you and your family are newer divers, or have junior divers this is the safest and most enjoyable way to experience Palau. For those advanced divers, who want more action, custom private charters are a great way to keep all you advanced thrill seeking divers A private charter can start as early as 7:30 AM and come back as later as 4 – 5 PM. This is a great way to beat the crowds and get to the dive sites early! Rental dive gear and permits are extra. A typical dive day would include up to 3 dives per day or two dives per day and a trip to Peleliu or Jellyfish Lake. Of course if you are nice to the crew they may stop by a couple secret spots they have for snorkeling or showing some of the WW II history. Private charters are reasonably priced and average $50 more per person with a group of 4. We offer daily private charters and would love to cater to you and your family or group for a day or a week of private diving and adventure!